I provide a cooking class and teach all kinds of Japanese dish at my home in Kamakura. I was born to a Japanese cuisine restaurant owner/chef father and grandfather, and a Ukrainian mother. I grew up eating both traditional Japanese cuisine made by my father and European cuisine made by my mother who both love cooking. Because of my family, I naturally took interest in cooking from an early age, learned cooking from my parents, and mastered every Japanese home cooking at a young age. Also, I studied many cuisines to get to know more about food. That gives me more good influence to what the real Japanese food is. I studied in America for 3 years when I was in my teen, and at the same time, I traveled to a lot of countries for tournaments as a tennis player such as Jamaica, France, Canada, so many that I can't name them all. During that time, I had many opportunities to home-stay and go to local restaurants, and taste delicious home cooking of each country's customs, cultures, and homes. I still remember those wonderful experiences vividly. I relive the wonderful times I had with the families and countries. For me it was natural to be in Japanese culture before I went to other country. But once I go outside of my country, I realized how different culture they each have. I had many chances to offer Japanese culture to foreigners when I was outside Japan, and I enjoyed doing so. I grew interest in the differences between Japan and their countries. Since then, I became more aware of Japanese culture. I started this cooking class because I wanted give people from other countries the experience of Japanese culture in reality through authentic Japanese cuisine. 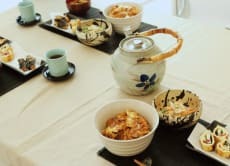 I would like you enjoy a home cooked Japanese meal with a local during your trip, and feel Japanese culture in reality through authentic Japanese cuisine.